Below is a picture of a garden stake I bought at Crate and Barrel. They were $10 each and worth every penny. I bought six of them. My best friend already owned six. They are actually for candles, but they worked as aisle runners with water and peonies in them. 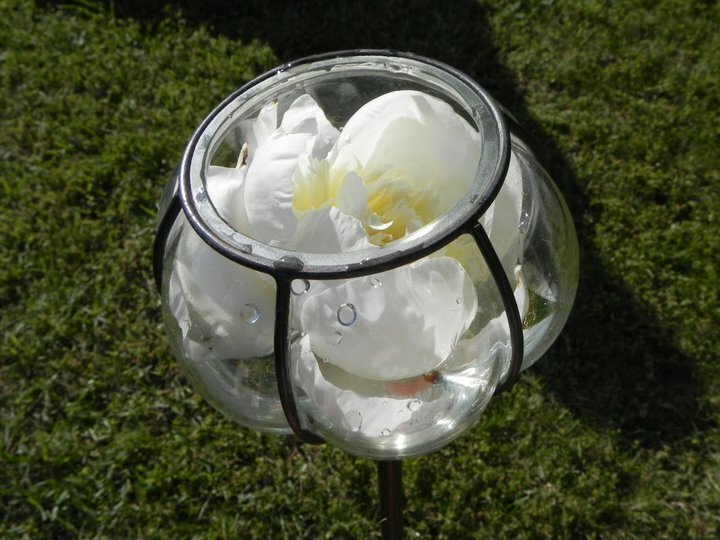 The glass tops screw into poles that we placed in the grass along the aisle. We made a longer aisle with less chairs in each row because Erin wanted a longer entrance. Dan, Erin's fiance, is a woodworker, by trade. I saw ribbon wands in the movie "Sense and Sensability" and knew I wanted to do this for a wedding. Erin had Dan cut narrow strips of rectangular wood in his shop. He made an upward cut into one side about 1" from the top. This allowed us to cut 2' lengths of ribbon in three colors. 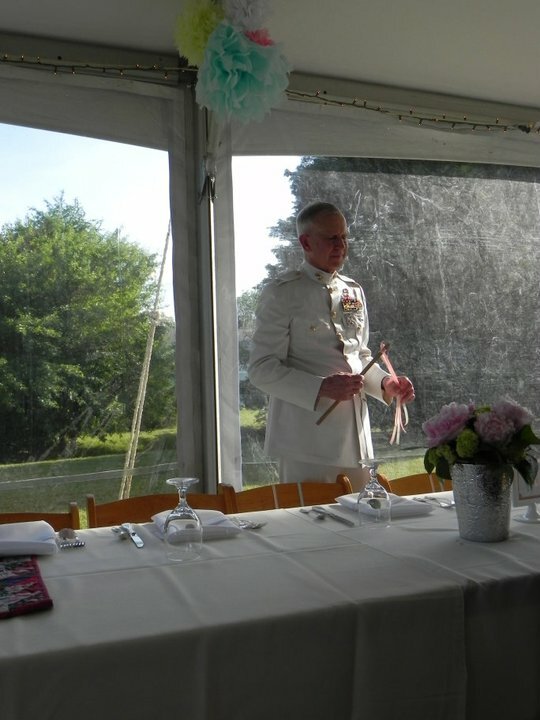 We used two lengths of ribbon for each wand. 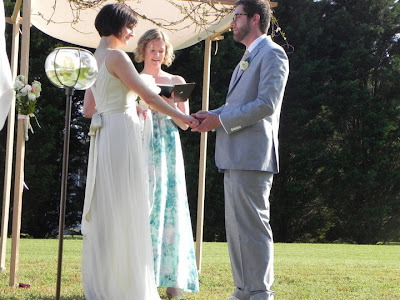 The upward cut allowed us to anchor the ribbon into the sticks and tie a knot opposite of the cut. In the photo below, you can see the guests waving them during the ceremony. Erin's cousin Maryanne, my daughter, designs floral arrangements for a hobby. She made the fourteen arrangements you see below. It was handy having a beach house with a big kitchen and a big screened in porch. I had been collecting the silver vases all year from multiple Safeways. They were only $6 a piece. They came out durning the holidays, and we started grabbing them up. Maryanne soaked the oasis in the beach house's bathroom tub. She normally soaks them for at least an hour. Because we were bringing all of the flowers out of town, on a four hour drive, I ordered them from a local nursery. Flowers can be ordered at WHOLESALE through places where you buy plants. Who would have known? They even provided us with advice for which flowers travel well, and buckets to carry them in. 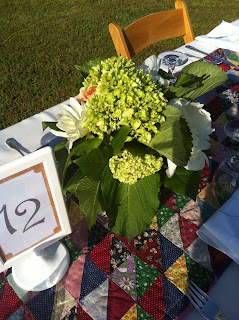 Our flower budget was $750 dollars inclusive of arrangements, bouquets, corsages, etc. I am currently doing a wedding with a $300 budget. I am using the same nursery, but we are making living arrangements of flowering plants. 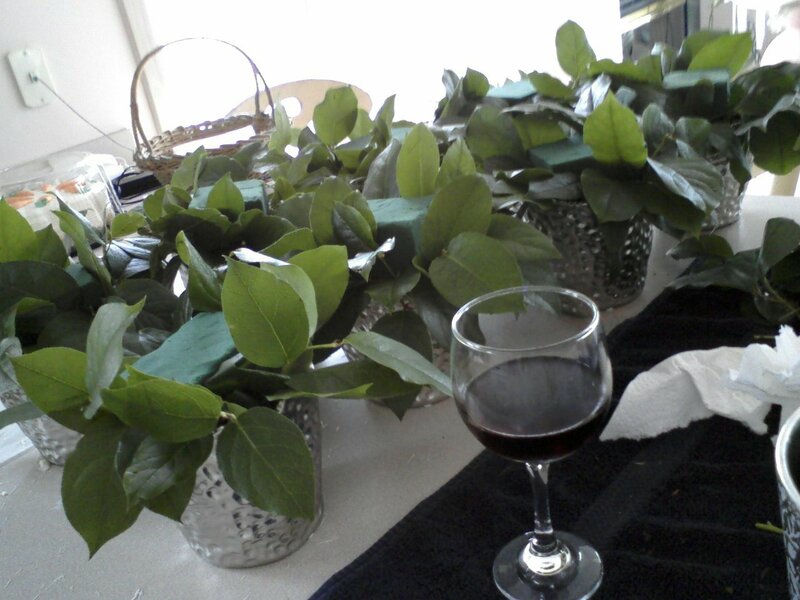 I am lending the bride my Pottery Barn serving dishes to plant them in--using liners. The bride's mom wanted to use them for the rehearsal dinner and reception (only six tables this time) and then give them away. This will also be an out of town wedding. We are reusing the bridesmaids bouquets for the reception food tables by putting them into ceramic antique water pitchers I found. 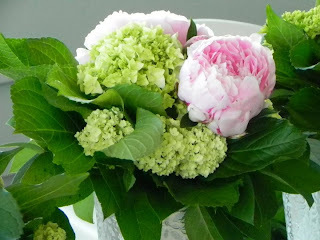 For Erin's wedding flowers in May, we used peonies, dahlias, and green hydrangeas. These are inexpensive flowers in season with a big impact. Dan, our woodworking fiance, built the wedding gazebo structure with 4 long poles and four medium poles tied to the corners with rope. They wanted to drape a plain fabric to the roof. I think it looked wonderful. The same nursery from where I got the flowers ﻿had a grapevine with silk flowers attached. I think it added just the right touch. Below is a picture of the tent. We ordered twinkle lights from the rental company that started at any point and spread out to the edges. We also added inexpensive twinkle lights that we bought in bulk after the holidays. We added these to the perimeter of the ceiling. We also hung tons of paper lanterns. I hit every Pier One all year to buy them on sale. I cut cardboard circles for the bottoms of them and placed battery operated candles in them. The nice candles have on/off buttons, 4 hour buttons, and 12 hour buttons (one three-way switch). We turned them on in the morning when we hung﻿ the lanterns that morning. 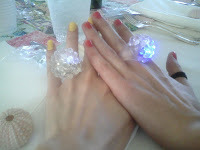 They glowed all evening. This is the bride Erin at her bridal shower. She is modeling the newspaper hat that won the hat contest. I place a double sheet of newspaper over someone's heat. 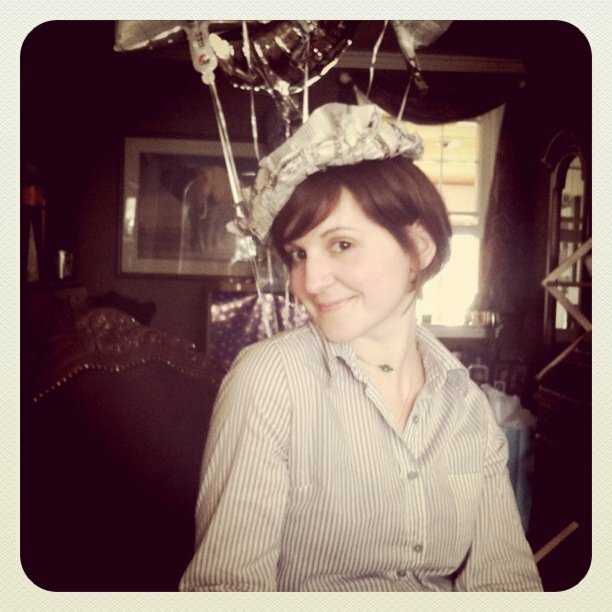 I wrap masking tape around their crown to size the hat. 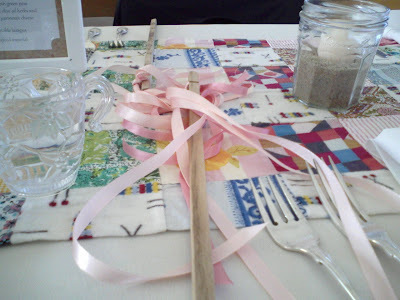 Guests roll, cut, add, and design elements to decorate them--all only using newspaper and masking tape. Below is one of the outside tables. 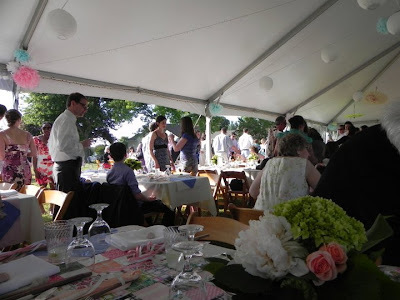 Erin had to add four tables at the last minute because when she invited 140 friends and family to an out of town wedding, we expected at least 40 people not to show. EVERYONE CAME. She got the table numbers at IKEA. They had the menu printed on the oposite side. 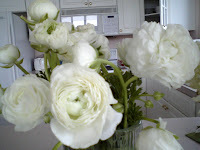 At Valentine's time, a local florist introduced me to the renunculus flower. They are small and delicate looking, but very hardy. They were great in the corsages. Below is a ribbon wand on another of the quilt patterns. We used jars with sand and candles on the tables. She and Dan also went to a local restaurant and got them to donate wine bottles. They removed the labels, washed them in the dishwasher, and used them as water pitchers on the tables. I found this cabinet door with four windows. I designed a floral watermark (lighten picture you can print on) in Photoshop. We printed the table assignments on them. It helps that my husband is an architect. I can send him graphics by email to print in larger sizes. We hung this on one of the big trees in the backyard. Erin and I sat up all one night on a beach trip a year before her wedding. I asked her what kind of wedding was she imagining. 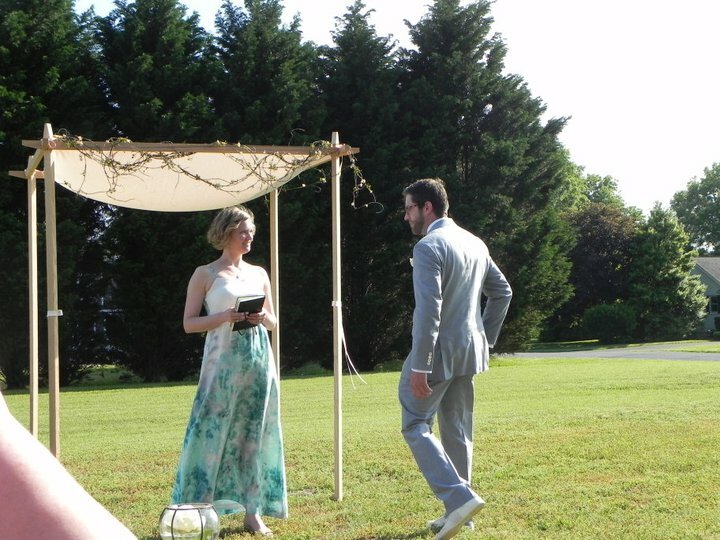 She told me she wanted the wedding and reception in a backyard. 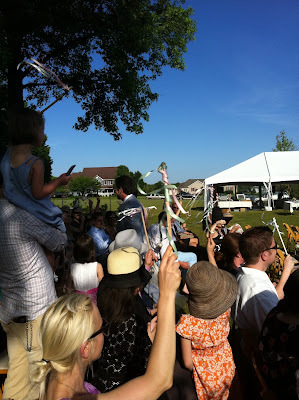 She wanted the ceremony under a huge tree. 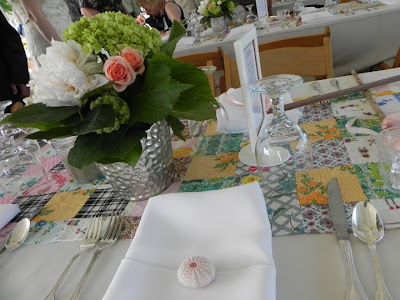 She wanted eclectic scarves on the tables. She wanted it near the beach, but not on the water. Fortunately for Erin, her fiance's parents' house met all of these descriptions. There was a huge tree in the backyard. 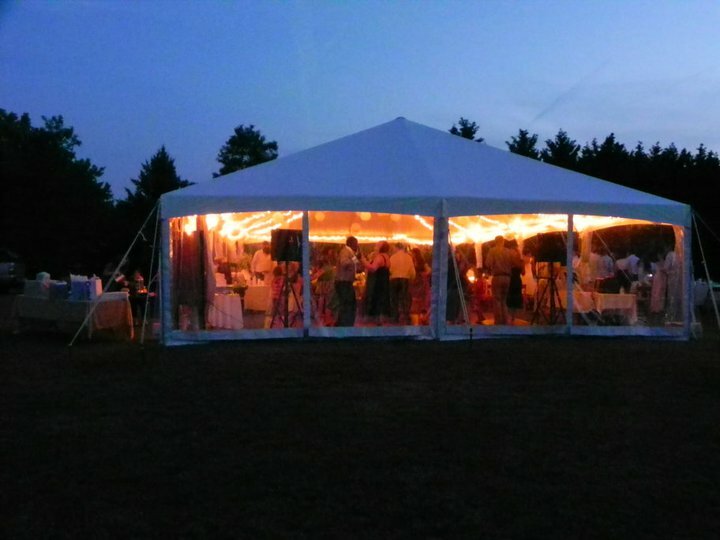 The yard was big enough for a tent. And his parents lived ten miles west of a beach. 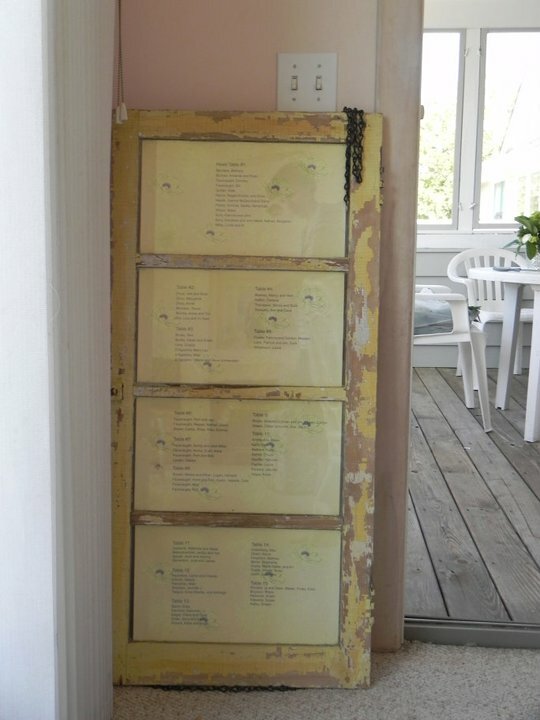 When the save the date cards came 12 months in advance, I immediately went onto VRBO (vacation rentals by owner) and rented a house. I also encouraged my sister, Erin's mother, to rent a house. Erin rented a house for herself, fiance, and their friends. The next step was to call a rental company. We did this 12 months in advance to assure ourselves we had a dry place in case of rain. We signed a contract for a tent, chairs, tableclothes, glasses, plates, and silverware. I even convinced the company to deliver the rentals three days ahead of time, so that I could enjoy my beach week also. Starting right then, I started hunting for quilt tops at antique stores. These are less expensive than quilts. I hated to cut these quilts into runners, but I did so by making them wider than a normal runner to save the integrety of the pattern. Because long tables are all 8 feet in length, I added matching ends to each quilt to tie them together. I put a solid square at a diamond angle and added four pink gingham triangles to each corner. All with a sewing machine--no hand stitching for me. I wanted to make them stiff, so I ironed iron-on fusible interfacing to the back. You can see them in the picture below. Erin and Dan ordered an Porta Potty trailer. It was next to the garage and had running water and flushing toilets. It was just like a real bathroom The ladies' side had two stalls with doors. The men's side had one stall. It cost $900 to rent. 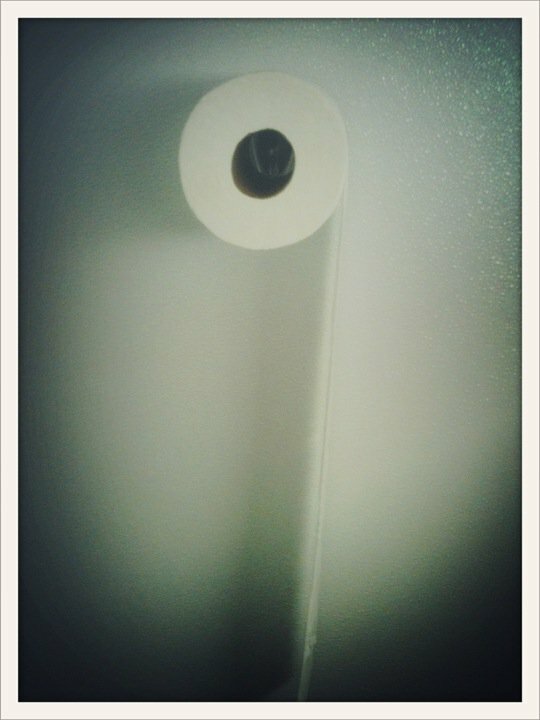 But...it didn't have a toilet paper holder. I had my kids stop at a local hardware store and buy new plungers. I wrapped ribbon and bows around them. 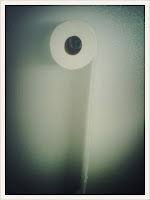 Each one held three rolls of tp. Problem solved. Here is a close up of a flower arrangement. 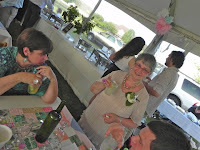 On the left is the wedding planner *me) taking a break as her grateful sister, the mother of the bride, brings her a drink. To the right is a picture of corsages and boutineers. The happy couple exchanging rings. 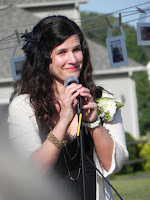 Her friend sang for the ceremony. Notice how we hung frames of the happy couple on the clothesline. 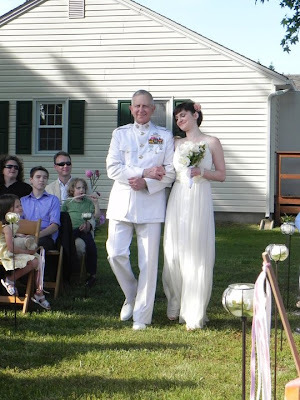 Erin and her dad walk down the aisle. 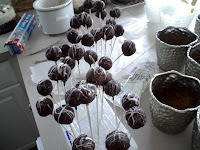 Above is picture of chocolate cake pops drying after dipping them in chocolate. Next to the box of aluminum foil is the small crock pot I got at Target which is perfect for dipping chocolate. I melt chocolate candies (Michael's) in microwave and then keep it warm in crockpot on LOW setting. Google cake pops for recipes. The picture above shows the silver vases, with oasis, and lemon leaves. Lemon leaves are perfect filler to start an arrangement. They are very inexpensive. 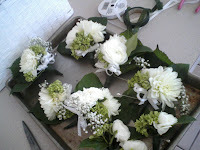 We made 60 arrangements for another wedding. Lemon leaves make life easier by hiding the sides of the oasis. 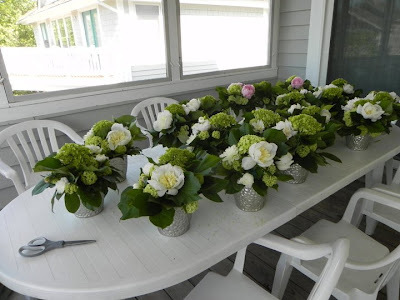 We only had to make 14 arrangements for Erin's wedding.